Click here to return to the Hollow Double Braid tutorial. Use the same setup shown below for the EDGE pattern except, instead of bicolor loops on the right hand’s A and B fingers, use two all-orange loops. All loops bicolor, of the same two colors, one shank dark and one shank light. This 8-loop hollow braid has color-linking at the final loop exchange of each braiding cycle, as taught in my flat double braid post. That keeps the left hand’s grey and white loops on the left hand, and the right hand’s pink loops on the right, making each side a different color. 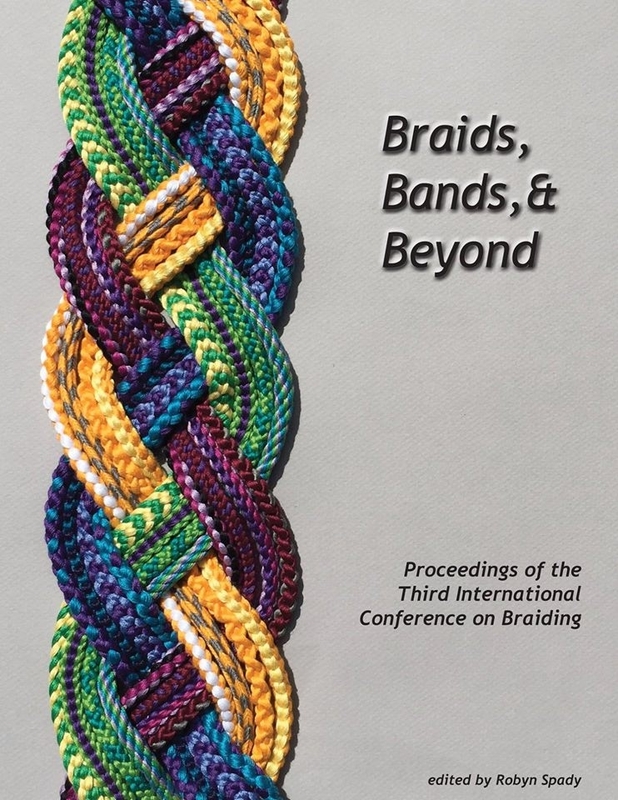 Here, in a hollow double braid, the two different colored sides of the braid end up seeming like the “top” and “bottom” of the finished braid. During braiding, the braid was on edge, as shown in the photo. The braid also has openwork areas, made by not turning any of the transferred loops for (here) 8 braiding cycles. No bicolor loops. The grey and white ‘W’ pattern can only be made with 8 loops, not 6 or 10 (but 6 or 10 loops will make a nice non-W pattern). I used embroidery floss, but doubled the strands to make a bigger braid. The left hand holds 2 grey and 2 white loops. The right hand holds 4 pink loops. While you are braiding, the left loops and right loops should never cross over to the other hand. Instead of crossing, they are linked together at the final loop exchange by being exchanged twice (shown in a video in the flat double braid tutorial). I braided “hollow” for 8 cycles, then “divided” (no loop transfers turned) for 8 braiding cycles to form the openings. Fewer divided cycles will make shorter openings, more divided cycles will make longer ones. The openings may not stay open on their own if the braid is stretched lengthwise. To keep them open, consider stringing a ribbon through the braid and tightening it to keep the braid from stretching out, or inserting something into the openings to hold them open. Note—if you want the pink side to show (like a slight border) around the edges of the grey and white side, as in the photo, be sure to set the colors up exactly as I described, with the pink on the right hand, and the grey and white on the left hand, and do the final loop exchange as I teach in the videos: Left loop AROUND right loop (two times). If you do it oppositely, the pink side will have a (gray and white) border, and the grey and white side won’t have a border. 6-loop hollow braid, right loops black; left loops white and bicolor white+other. Linked loop exchange. 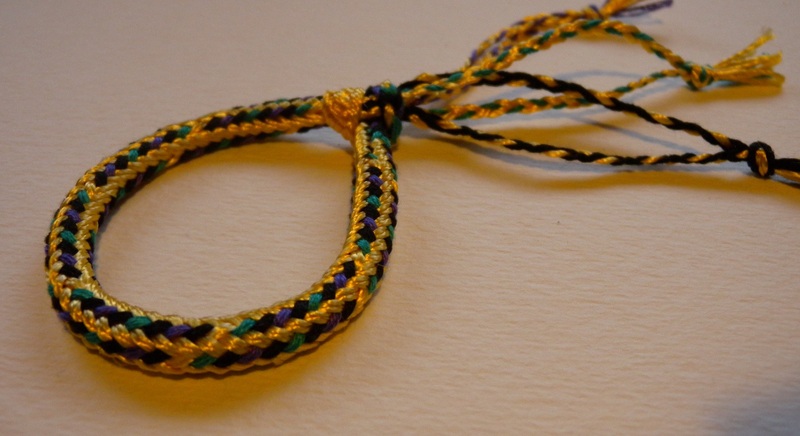 16-loop hollow double braid with 2 kinds of linking—at final exchange, and also at right hand outer loop transfer (turned twice)–with bicolor loops this can result in 2 bands of lengthwise colors on the right side of the braid. Right loops bicolor; left loops single colors (4 green, 4 ecru). 8-loop hollow braid. Right loops are bicolor tan/black, turned twice. Left loops not bicolor. Final loop exchange done twice. Both types of linking are explained in an earlier post. The braid below was made with 9 loops, which I haven’t taught yet for double braids, but below the photo I give directions for both an 8- and a 10-loop version. (Reduce the 8-loop version by 2 loops for a 6-loop version.) 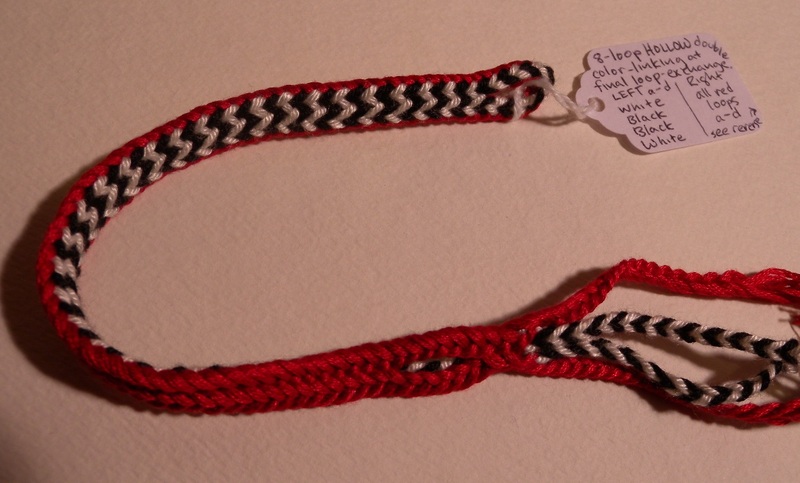 Btw, the braid in the photo really is a double braid, even though it has an odd number of loops! Over-explained under “what is a spanish braid?” near the end of my 7-loop Spanish braid tutorial. The gold is viscose rayon. The other colors are cotton embroidery floss. The 10-loop version has two contrast all-gold loops instead of just one; and the 8-loop version has no contrast loops (in other words, no all-gold loops, so no gold “interruptions” going across the multicolor columns).